Add the flank steak to a large baking dish and season it with the salt and pepper. In a bowl, whisk together the olive oil, brown sugar and garlic cloves, then cover the steak with it and place it in the fridge to marinate. I marinate anywhere from 2 hours to overnight. When you’re ready to cook the steak, you can grill, broil or pan sear it to your liking. I tend to broil it as I find that easiest. Preheat the broiler in your oven and move the oven rack as close as possible. Place the steak on a broiler pan or baking sheet and broil on each side for about 5 minutes. This will result to a medium to medium-well doneness in my oven. Allow the steak to rest for 10 minutes before slicing it thinly against the grain. 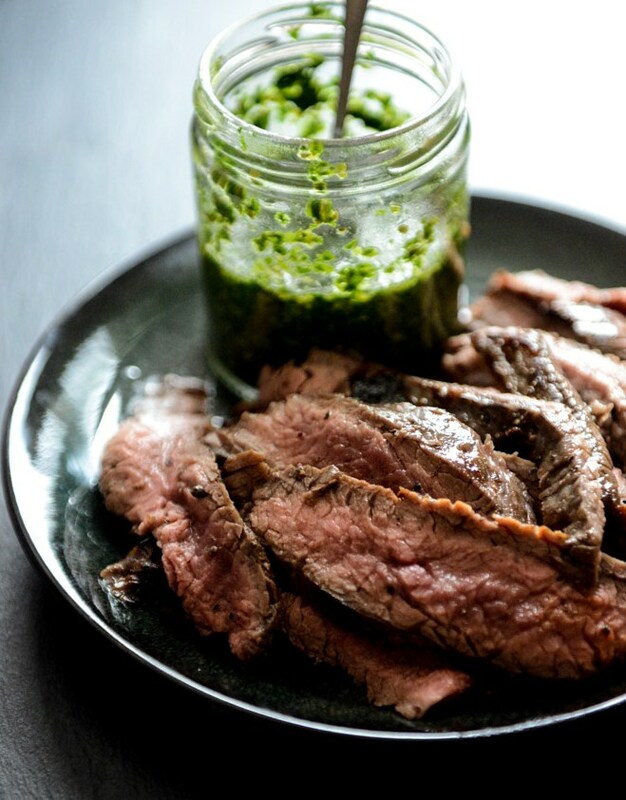 Serve it immediately with the chimichurri.